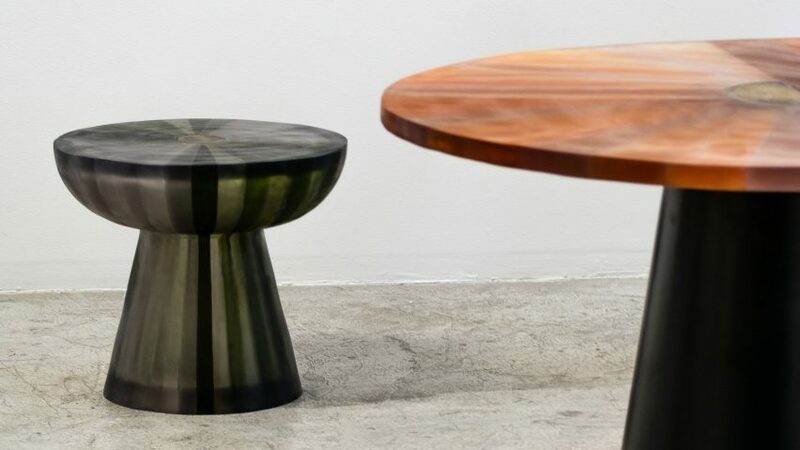 Mexico City's Mónica Calderón Studio has called on architects, designers and artists to use resin for a collection of furniture and homeware, which includes stout plant pots, and tables and stools in colourful gradients. Local architects Ezequiel Farca and Cristina Grappin, Mexican designer Moisés Hernández, Cuban-American artist Jorge Pardo and Los Angeles-based designer David Wiseman all contributed designs to the Cala collection, which launched during this year's Design Week Mexico. Mónica Calderón Studio, established by designers Mónica Calderón and Úrsula Verea in 1999, specialises in products made from polyester resin and tasked the participants to come up with new approaches to the same material. The results pair resin with marble, wood and bronze, while following the aesthetic and technical styles of each contributor. "For 19 years we've had our studio, collaborating with a lot of designers," Calderón told Dezeen. "We focus on one material because you can design and use it for different shapes, designs, colours and finishes." "It's a product where you can explore all the possibilities and come up with any design," she added. "We've really become the experts on resin and so this time we partner up with creatives to [team it] with marble, wood and bronze." Farca and Grappin – founders of Ezequiel Farca + Cristina Grappin – teamed up with Hernández to create two tables and a stool. They feature blocks of resin in different hues slotted together. Set on a heavy black marble base, the top of the long dining table is patterned with tones of orange across one half and shades of grey on the other. Triangular resin elements are pieced together to create curved ends. A similar arrangement forms the circular top of another table, which features a paler marble base, and the small greyscale stool. Pardo's contribution is a series of plant pots in four colours: red, yellow, blue and black. The artist – who is now based in Merida, Mexico – made the unusually shaped pieces from moulds to give them a slouchy form. Diamond-shaped indentations are found on the front and back, while protrusions that resemble lips bulge from the other two sides. Drawing on his past bronze designs, Wiseman has created a delicate metal shelf with pockets filled in with resin and terrazzo. These and the other designs in the Cala collection are each created as a limited edition of six, and available to purchase. Mónica Calderón Studio launched the series in an exhibition called Materia, which was held at Labor – a Mexico City gallery located at Francisco Ramírez 5, in the Ampliación Daniel Garza neighbourhood. "The name Materia refers the alchemy: the transformation of everyday raw materials into precious objects," said the studio in a project description. "The word transformation [is] key, since the exhibition focuses not only on the objects and final installations, but also on the creative processes of the artist, designer or architect and the workshop." The exhibit formed part of the Urban Territory public event series, held from 13 to 14 October 2018 to coincide with Design Week Mexico. Events included an exhibition of models by Mexican architect Alberto Kalach in the Luis Barragán House and Studio. The residence, which is one of Barragán's best-known buildings, was also opened up for impromptu public tours. Design Week Mexico took place across the city from 10 to 14 October 2018. EWE, Davidpompa and Bandido were among the other Mexican design studios to exhibit works during the festival.